Pale Stone & Dark Charcoal striped baby blanket wrap and hat in newborn size. Extremely Soft & warm, luscious fibres with a lovely handle. Being a knitted blanket wrap, it is nice & stretchy to wrap your wriggly precious baby in snuggly. These natural fibres have many amazing properties. The most useful one is that it can be used all round. Breathable fibres that maintains baby's temperature with out over heating them or making them cold. This is expecially important when they can not do this in the first six months. ESPECIALLY DESIGNED to use in bassinets & small cots, buggies and carseats. Great as a travelling blanket wrap in the car. . Blanket Approx size: 62cm wide by 100cm length. The fibres are smoother; it does not irritate baby's delicate skin. Not to mention that it is extremely WARM, Soft & stretchy as a knitted blanket. 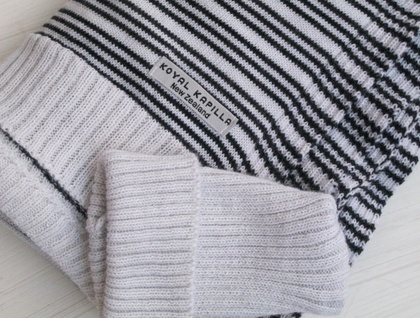 Koyal Kapilla New Zealand is designed & knitted in-house in Auckland. Yarns used are sourced from local suppliers as well as from Europe. Any questions and feedback is most welcome. Thank You.